Frying chicken is a messy business but always a worthwhile one, though I did wonder a little when I woke up the next morning and smelled fried chicken in my hair. For this last Korean Food Sunday, the menu was as follows: my mom’s fried chicken, fried sweet potatoes, seaweed soup, tangpyeongchae or mung bean jelly salad, cubes of pickled white radish, sautéed anchovies, dried radish strips tossed in a spicy sauce, and kimchi, as always. My plating is a disaster. It was only the second time I’d tried making this fried chicken. It’s an interesting recipe, involving a batter made only of potato flour and water. 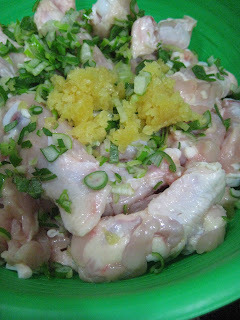 The chicken gets seasoned earlier, with lots of garlic, green onions, salt, pepper, and a drizzle of sesame oil. Making the batter is like walking a tightrope—too little water, and the whole thing solidifies like cement. Too much, and you feel like nothing is getting coated on the chicken. But as finicky as the batter feels, it isn’t really. Even a glaze of potato starch batter on your chicken will crisp up instantly. It was the first time I’d tried frying the chicken with a candy thermometer attached, and I was also surprised to see that the best frying temperature seemed to be about 250-275 degrees Fahrenheit, about 50-75 degrees less than usual recommended temperature for fried chicken. At about 350 degrees, the garlic on the chicken burnt to a crisp and the potato flour batter got scarily dark instead of staying light and golden. The lower temperature might also work since the recipe calls for wings, small pieces of chicken that cook up quickly. I have no scientific reasoning to back me up, only that I know that it works. A little Googling revealed that there are lots of recipes for making fried chicken with potato starch, in the Japanese karaage-style, but no one does what my mother does, which is to add water. Just potato starch is definitely something to try next time, though the splattering can really be minimized if you use a nice, deep Dutch oven. This time, I also battered and fried slices of Asian sweet potatoes, which taste like chestnuts and fry up beautifully. I’m sure some people would season them with salt, but I like the very simple, almost wholesome flavor of plain fried sweet potatoes. My friends liked them, too, maybe almost as much as the chicken. The cubes of pickled white radish were completely experimental. I came home from the farm late on Saturday night, stressed and a little overwhelmed by my life, but I had already bought the radishes earlier that week and I really wanted something light, bright, and not-spicy to eat with the fried chicken, like the sweet and simple 무, or muh, they sell at Korean fried chicken places. It turns out cutting up radish cubes at 11 pm is very therapeutic, as are two glasses of wine. I couldn’t find a recipe, so I salted the cubes with as much salt as I would for kkakdugi, or spicy radish cubes, and added about a cup of vinegar, 2 tablespoons of sugar, and enough water to cover it all. The flavor wasn’t quite the same, but I liked that you could taste more of the slight natural bitterness of Korean radishes with the easy sweetness of the sugared vinegar. Because I had to fry the chicken in batches, I spent most of the dinner standing by the stove, with my back to the table, passing chicken and sweet potatoes behind me every 10 minutes or so. But I could still hear people saying things like, “This is delicious!’ and “How did you get it to be so crispy?” One friend had been in Portland, Maine, and when his flight on Sunday got cancelled, he jumped on a bus to get back in time for the chicken. When he promised me that it was just as good as the last time he’d tasted it, when another friend who calls herself a vegetarian kept eating wing after wing, I felt very gratified. I’m still learning how to cook for a crowd. Nine people don’t eat as much as eleven, and I still have almost 4 lbs. of chicken thighs in the freezer, already marinated and only momentarily relieved from their deep-fat destiny. I’m not so good at taking notes for recipe development when I’m harried about a dinner party, and I was so worried over the chicken, I forgot to taste the mung bean jelly salad with all its vegetable accompaniments. I can tell you now the photos of these dinners will always be haphazard. But it is a lot of fun to feed people. 1) Fried food is delicious. 2) Fried food is at its most delicious when it has just come out of the fryer. These are two difficult truths, when one is eating fried food at home instead of a restaurant. It means the smell of hot oil and whatever has been fried can’t dissipate before the dinner guests arrive. It means that the cook will not be a gracious host when the dinner guests do arrive, because she will still be frying and frantic. The best way to deal with this problem is to only fry for those you love and who love you. These people will not care that you are still in an apron splattered with batter, they will not care that they will also smell like fried potatoes or chicken or codfish potato balls. Best of all, they will be willing to just stand around the stove and eat the hot little goodies with their fingers. I know this is the best way because the best fried chicken I’ve had at home was last week with my mom, when we fried chicken wings on our portable stove and ate them right in the kitchen. My father was out to dinner with his friends, and I wanted to learn how to make the dish I have loved my entire life. Our camp stove has never seen a campsite, but it is very useful at home when you want to avoid grease splatter all over your real stove. My mom laid out a bunch of newspapers on the kitchen table and placed her wok and the camp stove on top. She quickly made a crisp, raw salad for me, but we didn’t bother to set the table or make anything else. Instead, we focused on the chicken. She showed me every step and we sat together in the kitchen, alternating frying, eating, and laughing. I don’t know if this is a particularly Korean way to fry chicken, as it’s different from the “Korean fried chicken” I had with my cousin. 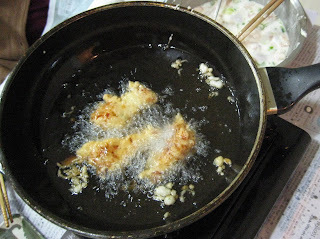 My mom couldn’t remember how or why she had started frying it this way, only that we all loved it. I think the key is that the chicken is seasoned with garlic, green onion, salt and pepper, before the potato starch batter is applied. 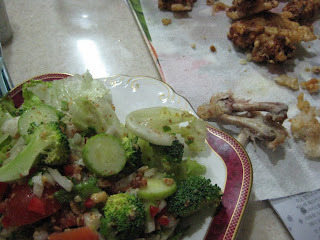 Or it might be that my mom has always used wing meat and eating such small pieces makes it as addictive as popcorn. Maybe it’s just something I love because it’s from my childhood, as it’s quite simple and sometimes a bit greasy if we wait too long to eat. But when I bite into it fresh from the fryer, and my mouth is burning from the heat and the juices squirting from the meat, I can’t stop because it tastes so good. I’m sorry the amounts and directions are so approximate; that’s the way my mom cooks. 1. Prepare the chicken by removing excess fat and making small cuts in the chicken meat to help it cook faster. 2. Add garlic, green onion, salt, pepper, and sesame seed oil to the chicken. Let it sit for 30 minutes to an hour. 3. Prepare batter by adding water to potato starch. The batter should be slightly thick, like pancake batter. Add more starch or water as necessary. 4. Add the chicken to the batter and mix well. The batter will not completely cover the chicken and obscure its meat, though it will when cooked. 6. Once the oil is ready, add the chicken to the pan. Don’t crowd the pan and fry the chicken in batches, taking all the chicken out before putting more in as that will cause greater fluctuations in the temperature of the oil. After 10-15 minutes, the chicken should be done. It won’t be completely golden brown, more brown in spots, as the potato starch makes a mainly white batter. I don’t know anyone like my cousin Young. She’s a writer, a former award-winning journalist who’ll urge me to read James Salter and Henry Miller, almost in the same breath as she’s pressing upon me a mix CD consisting mainly of Charlotte Church. She’s a good Korean girl, a daughter who respects and honors her parents in a way that makes Mulan seem selfish, and yet she also holds her liquor better than anyone I have ever met. She once did an oil painting of a bag of Funions—without irony. The girl loves Hot Pockets. The most amazing thing is that she doesn’t surprise herself at all, nor is she trying to surprise anyone else. Young is simply who she is. It’s hard to say what I enjoyed more the other night, her company or the delicate, crispy skin on the fried chicken we were eating. 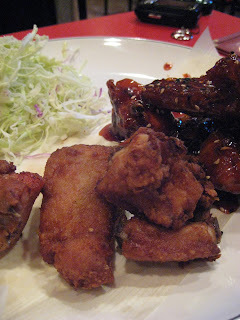 It may sound as if I am not respecting my cousin as much as I claim, but Korean fried chicken is spectacular. I could explain how it is different from the Southern-style fried chicken Americans know, except the New York Times already did it last winter. It caused a minor sensation, at least in my food-obsessed world. Chowhounds from all over the world were asking desperately, “Where, oh, where can I find Korean fried chicken?” Although in New York, you have to go specifically to Koreatown in midtown Manhattan, or to Queens, it is possibly in Seoul to simply decide, as we did, that you want fried chicken and wander until you find it. 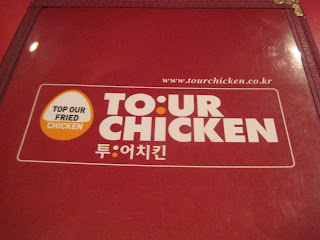 This particular place was called TO:UR Fried Chicken, a classic Korean-English abbreviation of “Top Our Fried Chicken,” close to the Shinsegae Department Store in Myungdong, a very young neighborhood of energetic shopping and drinking. (As a general tip, any place with the sign “Hof,” a bastardization of the German word “hofbrau,” will serve beer, soju, and fried chicken.) As hofs go, it was spiffy, with a bright red and black décor that was reasonably clean and attractive. As the night went on, it got more and more crowded with a good mixed crowd, businessmen, middle-aged women, and us, all happily eating fried chicken and drinking beer. The chicken was just as it should be, moist, ungreasy, and delicious. Koreans fry the whole chicken and then cut it up into pieces, serving it unadorned with just a dish of salt and pepper for dipping or coating it in a sticky, sweet, slightly spicy sauce. For 14,000 won, or about $15, we got half an order of each, as well as the usual accompaniments of shredded cabbage-cole slaw and cubes of pickled radish. We each got a big stein of beer, simple and refreshing. The more we drank, the hungrier we got, so we ordered another half order of plain fried chicken and shared another large mug of beer. I am not ashamed to admit we ate one and a half chickens in total. It was a lovely dinner. We talked, we laughed, we drank, and we ate. Even though I’ve always loved and admired Young for all the ways in which she differs from me, it was nice to learn that we do share a key core value, a passion for Korean fried chicken.